Despite decades of indoor smoking bans and restrictions, new research from Drexel University suggests the toxins we've been trying to keep out are still finding their way into the air inside. Findings by a group of environmental engineers show that third-hand smoke, the chemical residue from cigarette smoke that attaches to anything and anyone in the vicinity of a smoke cloud, can make its way into the air and circulate through buildings where no one is smoking. The study, which was recently published in the journal Science Advances, further clarifies our understanding of just how pervasive the toxic chemicals of cigarette smoke can be—even in a "smoke-free" indoor environment. Its central finding—that third-hand smoke chemicals can be reemitted inside and attach themselves to aerosol particles—means that people are likely exposed to more of these harmful chemicals that previously thought. "While many public areas have restriction on smoking, including distance from doorways, non-smoking buildings and even full smoking bans on campus for some universities, these smoking limitations often only serve to protect non-smoking populations from exposure to second-hand smoke," said Michael Waring, Ph.D., an associate professor in Drexel's College of Engineering, and a co-author of the research. "This study shows that third-hand smoke, which we are realizing can be harmful to health as with second-hand smoke, is much more difficult to avoid." 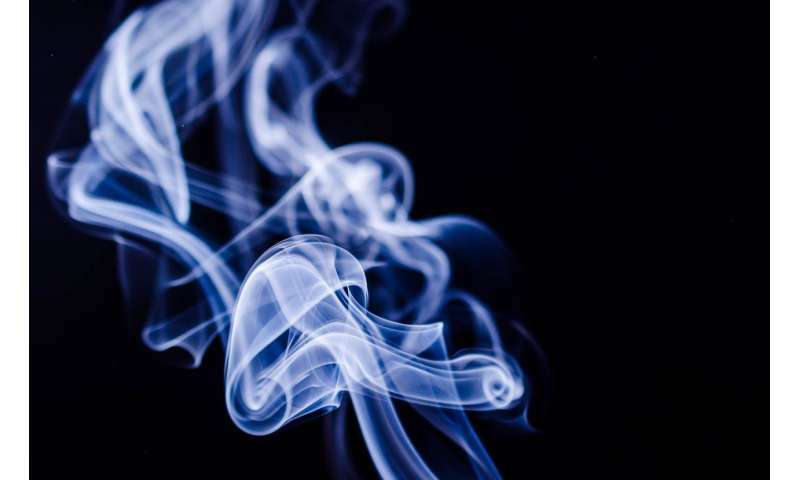 Peter DeCarlo, Ph.D., an atmospheric chemist at Drexel, teamed up with Waring, whose research focuses on indoor air quality, on this National Science Foundation-funded work that revealed the new pathway of exposure to third-hand smoke. "Aerosol particles are ubiquitous particles suspended in the air—they come from a variety of sources and are known to be detrimental to health," DeCarlo said. "The fact that third-hand smoke can attach to them, like it would to the clothing or furniture of a smoker, means that the potentially toxic chemicals associated with third hand smoke are found in places we wouldn't have expected." Anita Avery, Ph.D., a doctoral student working with DeCarlo was studying the transport of particles from outdoors to indoors by monitoring these particles inside an unoccupied, non-smoking classroom. The composition of these particles, measured by an aerosol mass spectrometer over the course of several weeks, provided a detailed look at the chemical differences between outdoor and indoor particles in the air. What they found was eye-opening. "In an empty classroom, where smoking has not been allowed in some time, we found that 29 percent of the entire indoor aerosol mass contained third-hand smoke chemical species. This was obviously quite startling and raised many questions about how that much third-hand smoke could be lingering in a non-smoking, ventilated room," Avery said. To investigate the cause of this surprising finding, Avery and DeCarlo simulated some third-hand smoke exposure in the lab. First, they pumped cigarette smoke into a Pyrex container, allowing the smoke chemicals to be deposited inside. Then they pumped any residual smoke out of the container before pulling outdoor air through it to clear out any second-hand smoke. After a day, filtered outdoor air was circulated through the container and the researchers measured the chemical composition of the aerosol particles it acquired along the way and compared it to outdoor air that hadn't passed through the container. They found a 13 percent increase in third-hand smoke chemical species in the air that went through the Pyrex container, which meant that, though it seemed as though the smoke had cleared, a chemical residue still existed -and found a way to attach to passing aerosol particles. "This means that our discovery was by no means unique to that classroom, in fact, it's likely quite a widespread phenomenon," DeCarlo said. "What we'd actually uncovered was a new exposure route for third-hand smoke—through aerosol particles, which are ubiquitous in the indoor environment." 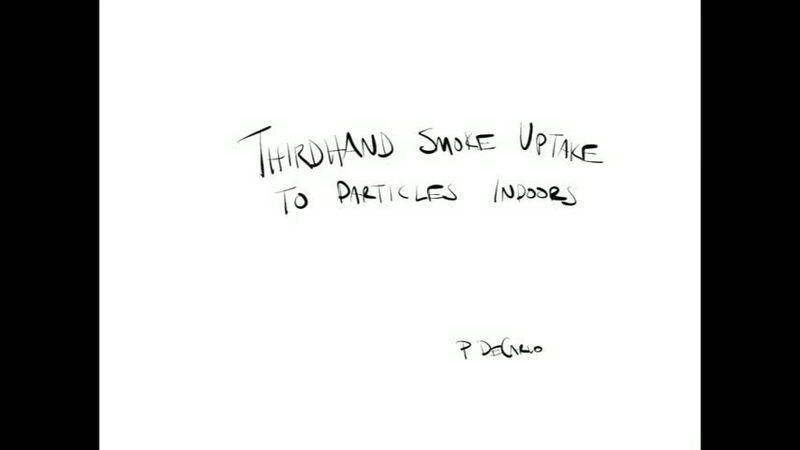 Digging deeper into the mechanisms that allow third-hand smoke to latch on to aerosols, DeCarlo, Avery, and Waring began to understand how they got inside and back into particles in the air. Previous research on third-hand smoke chemicals has shown that as they transition out of gas form, they can settle just about anywhere. They can attach to clothing and furniture, on skin or hair—even onto a sterile surface, such as the Pyrex container, as the Drexel researchers found. But they can concentrate in particles when the chemicals are in gas form and they are exposed to acidic, liquid aerosols. This means that they can be unwittingly transported into smoke-free environments—lying in wait for conditions that allow them to transition back into a gas and attach to aerosols. But as it turns out, this combination of conditions is actually pretty common indoors. The study suggests that third-hand smoke chemicals on indoor surfaces can "repartition," or return, to the gas phase when they're exposed to chemicals such as ammonia—which is common in buildings as it's emitted when people breathe and often found in bathrooms. And the aqueous aerosols they need for transportation? "In the summertime warm air with varying amounts of water content is brought into the building, mixed with recirculated air, and conditioned to cooler temperatures," they write. "This process leads to significant uptake of water by aerosol particles. This continuous summertime presence of aerosol water allows third-hand smoke chemicals to partition into the aerosol phase." Indeed, the indoor environment of buildings with mechanical heating, ventilation and air conditioning (HVAC) can be the precise confluence of factors necessary to spread these toxic chemicals. "The HVAC system not only serves to condition the aerosols to wet or dry states, but also to move air through a building zone. HVAC systems recirculate and disperse air throughout the multiple rooms of the zone served by the system," they write. "For this reason, a room located near a smoking area with smoke penetration or a room occupied by a smoker can effectively expose the other occupants served by the same HVAC system to third-hand smoke, even if they do not share space directly." The researchers note that the persistence of the chemicals in the indoor environment is also linked to the amount of surface area in a particular room or building. This is because the third-hand smoke that isn't inhaled can deposit just about anywhere—counters, walls, furniture even embedding in carpet—and later return to the air when conditions are right. "While most people expect that they'll be exposed to car exhaust, or other chemicals in low concentrations when they're outside—they tend to think that they're escaping all that when they step indoors," DeCarlo said. "Understanding that we are constantly exposed to these chemicals, even in our workplaces, is a challenge to communicate to the general population." And this research is only looking at ventilated spaces, such as office buildings or classrooms. Waring points out that concentrations of third-hand smoke chemicals are likely to be much higher in a residence, hotel room or rental car where people had previously been smoking. "The concentration of chemicals would be much higher in the home of a smoker or other places where there is less ventilation than an office or university building," he said. "These findings could also lead to important research about third-hand smoke exposure from e-cigarettes, which many people are using indoors and produce some of the same chemicals as tobacco smoke." Taken alongside recent findings about the health risks of exposure to third-hand smoke, this work brings the gravity of the situation into focus and raises important questions for future research about how we can limit our exposure. "Third-hand smoke is not something we're currently thinking about as a society when we talk about air quality," Avery said. "It's easy to recognize the presence of chemical pollutants if you can see or smell them, but this research reminds us of just how many chemicals we are exposed to that we probably aren't aware of. That's why we need to keep studying these indoor spaces where people spend so much of their time, so we can build a full profile of what exactly is in the air." Lol. Related Stories under this story "Third hand cigarette smoke not cause for panic." I hate cigarette smoke but the idea that the tiny amount of particles they are talking about here will harm anyone is just ridiculous. Really Jimmy? How about a small amount of cyanide or asbestos? It's not the amount it's the material and what it does to you. There are have amounts of roach turds in the air, mold spores, fly droppings, etc. Perhaps we should all stop breathing entirely? Our concern for third hand smoke should not exist at all. Humans have spent thousands of years around campfires, cook fires, etc. which put out significant amounts of participate matter with little effect. Third hand smoke has no measurable effect on is. The dose makes the poison. Third-hand smoke is not a toxin unless it causes toxic effects --- and no one has shown that. The research regarding second-hand smoke is controversial: there may be no significant (tangible as opposed to epidemiological) effect from it, either. But never let science get in the way of a good story. As the late economist Julian Simon pointed out, there is a pattern to these environmental scares. Asbestos is a good case in point. After the scare got started, the gov't resolved to get asbestos out of the schools. The result: later testing showed, the remediation of it spiked levels INSIDE the school buildings to higher values than before, when it was trapped in a matrix. Meanwhile, studies at asbestos mining areas showed no greater lung cancer risk among people exposed to extremely high environmental levels of asbestos, EXCEPT AMONG SMOKERS. Yet the public is convinced asbestos is extremely dangerous. It's not. Smokers aren't aware of the stench of a smokers hotel room, or of a smoker themself to a non-smoker. Olfactory ques are important between mother and child especially; mothers are not supposed to smell like dumpsters. In addition, tobacco smoke is not wood smoke or leaf smoke. "The 2006 surgeon general's report says there is no risk-free level of tobacco exposure…. There are 250 poisonous toxins found in cigarette smoke. One such substance is lead. Very good studies show that tiny levels of exposure are associated with diminished IQ." "Effectively, they'll get 20 times the exposure. "Studies in rats suggest that tobacco toxin exposure is the leading cause of sudden infant death syndrome (SIDS). We think it is [caused by] respiratory suppression." IOW kids don't want to breathe around their stinking parents. What should be a pleasant and comforting experience in reality makes them weak and ruins their apatite. So don't tell me your foul residue is harmless. LOL it's funny watching smokers try to rationalize their idiot dirt addiction. Meanwhile, studies at asbestos mining areas showed no greater lung cancer risk among people exposed to extremely high environmental levels of asbestos, EXCEPT AMONG SMOKERS. Yet the public is convinced asbestos is extremely dangerous. It's not. It literally is. Tobacco is dried and shredded leaves and stems of the tobacco plant. Burning a sightly damp log of wood in your fireplace or barbeque pit puts the exact same kind of tarry particulate matter all over the neighborhood, except in massively greater quantities. The reason why there's lead and other nasty substances in the smoke is because plants draw them up from the ground as they absorb water and nutrients - trees can have very high metal contents depending on the area, and the ashes may even be radioactive. Third hand smoke is again one of those public hysteria topics where effectively, you might be standing next to a diesel bus exhaust, or inhaling acetone vapors from your nail polish while complaining about someone smoking a fag. Well one major difference - it reeks. And no, you won't convince me that if I had been exposed to wood smoke the same way as tobacco then I'd hate it as much. Perhaps science should investigate what makes it so foul-smelling which might explain why it is so much worse for us. Ah. Pollution all around us so we ought to tolerate this one. I once overheard a fat guy discussing his diet and why he wouldn't bother to drink diet soda, using the same logic. I know you can be extremely stubborn. Tobacco doesn't "reek" any worse than someone burning old leaves in their yard. I actually rather miss the smell of a pub with the lingering scent of cigarettes. Brings back good memories though I don't smoke. No - just pointng out hypocricy and double standards. There's no flaw in his logic. There's no point in fooling yourself with a diet pepsi after a double bypass burger. This issue is rather about magical thinking and hysteria, where people are dead afraid of what are at worst minor annoyances, like people at Fukushima killing themselves in hysteria over radiation. It isn't. Same pollutants are generated by fireplaces, cars, power stations, etc. Direct and second-hand tobacco smoke is just a more concentrated source of these particulates and volatiles. Third hand tobacco smoke on the other hand is cleanliness hysteria. You carry all sorts of crud indoors just by your shoes - like if someone's been to an indoor shooting range, they're likely to carry an amount of lead dust with their clothes. Then there's other nasty stuff like formaldehyde offgassing from that IKEA shelf you just assembled, or the belch of acetaldehyde coming off of your cold catalytic converter when you start a car fueled by gasoline-ethanol mixtures. If you're worried about third hand tobacco smoke, thinking it's going to do you worse than you already are, you really should be wearing a respirator mask absolutely wherever you go. It's like the sudden brouhaha about graphene microparticles as a new threat - which is literally the same as pencil dust that's been around for ages.